Spring has finally arrived which means tugging on our rubber boots and heading out for walks in the local “forest” after the morning drop-off at school. And so it went. We tromped around in the newly thawed earth, enjoying the sound of our boots sticking in the mud. “There’s that green stuff! And there, and THERE!” Today we learned that “green stuff” is moss and likes damp, dark places. Followed by a timely reminder of why we empty our lunch bags every day. My reverie came to a screeching halt. We both gawked in silence for a moment and then ran away. I mean RAN. At this point, I tried to get back to our previously fun adventure mode. I suggested we take the long way home, maybe check out the creek. Little wanted nothing to do with that. Offers to go to the park were declined. “Let’s just go home,” he told me. 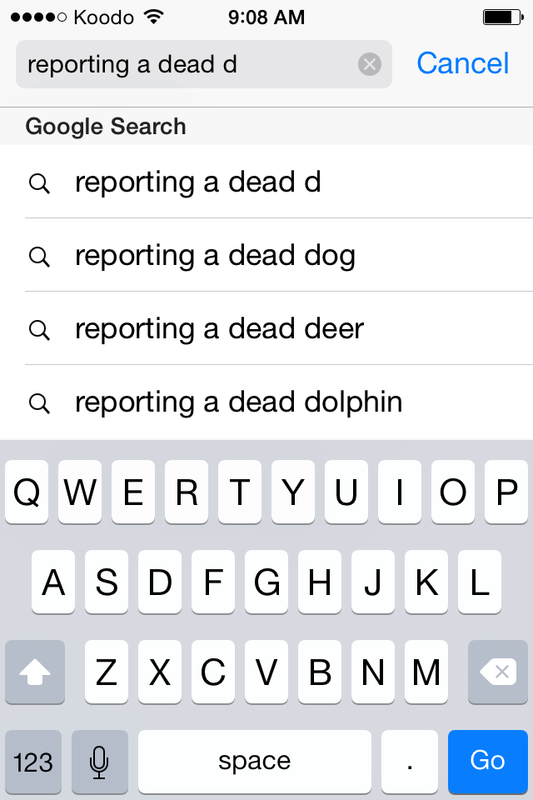 Now I know what to do if I come across a dead dolphin. Hah! I think my boys would have been excited and would have poked it with a stick. I can see my older ones doing that. Ugh. I would do almost anything for you all, but I’m not going back. If you did take a picture of it, not only would the Pinterest people have something to pin, but the phone could’ve recorded the geolocation data to report to animal control. Bleh. At our previous apartment we would play out on our balcony a lot because it was so much easier than going downstairs and/or to the park. We had multiple dead birds ruin that for us. Why is nature so uncooperative? My family and I, too, were on a walk this spring, when Bryan says “Look, the Easter bunny!” It was a dead rabbit on the side of the trail. Emma and I both screamed like the girls we are, and Hannah didn’t see it. Still a little traumatized. You would not have liked the Chinese restaurant we ate at once – the duck was served with the head still on. Did you use it as a puppet towards the end of dinner to tell duck jokes?